“Why do you not want to read the violent paragraphs of the Qur’an?” Piers Morgan was asked by Ramthrax on Twitter after interviewing the ‘hate preacher’ Tommy Robinson. To his credit, the Twitter colossus (5.8million followers) bothered to respond to the Twitter flea (33 followers): “There are many more violent paragraphs in the Bible. Should I read those out too?” he parried. His grasp of theological hermeneutics clearly isn’t great: he appears to lack any methodology of scriptural interpretation, or any appreciation of how one may discern contextual truth, ambiguity or falsity in a purported divine message. But Piers Morgan doesn’t really care: he is a professional media gob. He smites whatever gets under his skin, which is, of provocational necessity, both thick and thin. Anything might rile him, but nothing and no-one will trounce him. He is smug, self-righteous and invincible. It’s his job. 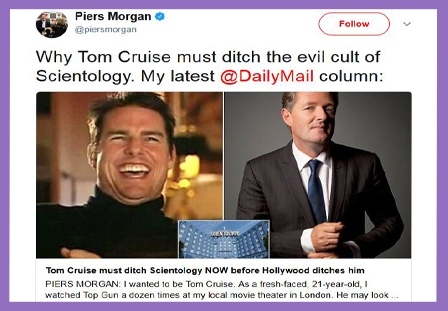 Writing in the Daily Mail previously, Piers Morgan showed a marked lack of respect for Tom Cruise’s religious beliefs, which are grounded in Scientology. Robinson sought to expose Morgan’s hypocrisy by highlighting this article. By calling Scientology a “vile cult” in the article and an “evil cult” on Twitter, some might say he sounds like a bigoted lunatic stirring up hatred. He would, of course, never refer to Islam as a vile cult (or an evil cult): he leaves that to bigoted lunatics like Tommy Robinson. Nor would the Mail have commissioned such an outrage (for obvious reasons). Only religious bigots and right-wing extremists set out to offend Muslims with blasts of Islamophobic zealotry and racist hate. Piers Morgan slings mud at many bodies and bands of people (especially when he is paid to do so), but the followers of Mohammed are not among them (for obvious reasons). You simply don’t juxtapose the religion of Islam or the name of Mohammed with the word ‘evil’, or all hell breaks loose, as Pope Benedict XVI found in the global response to his Regensburg lecture. Scientology is a recognised religion, and the feelings of its followers ought not to be summarily slapped away, for that offends against the zeitgeist of mutual respect and tolerance of different beliefs. And calling someone’s faith a ‘evil cult’ is, well, a bit rude, not to say intolerant and disrespectful. Scientology is a body of religious beliefs and practices developed in America in 1954 by L Ron Hubbard. That’s what it says on Wikipedia. His ideas were called Dianetics (from Greek dia, meaning ‘through’, and nous, meaning ‘mind’). That’s from Wikipedia, too. So hatred against Scientologists might be considered Dianephobia. That isn’t on Wikipedia: you read it here first. But if Piers Morgan’s incitement against this religion causes any significant backlash (or, God forbid, abuse of Tom Cruise and criticism of his prophet L Ron Hubbard), the term may need to gain traction. You might think Scientology to be religiously rubbish, as John Gummer told the House of Commons in 2007, then insisting that his own Roman Catholicism was “religiously correct”. But who determines this, and by what rationale? You might consider Scientology a barking mad cult of spiritual oppression and psychological manipulation, but one man’s pseudo-religious cult is another man’s quasi-spiritual sect, and either may be yet another man’s bona fide religion of orthodox metaphysics; the greatest arbiter of truth ever discerned for making sense of the meaning of life in an uncertain world. That’s clearly what Tom Cruise believes, along with all of his co-religionists. So who is Piers Morgan to hurl theological brickbats? And if he may do so at Scientology, why may Tommy Robinson not do so at Islam? Does not freedom of religion include the right to repudiate the beliefs of others? Does not freedom of speech and expression include the right to mock, scorn or satirise the tenets of religion and belief? Islam is a body of religious beliefs and practices developed in Arabia in 610-632 by Mohammed. His ideas are well known, as are the acts of his followers and the backlashes against them. The point of this post is not to disparage Islam or demean Muslims, but to inquire why one’s man’s bigotry is tolerable while another man’s bigotry is nigh-on illegal. Why can Piers Morgan freely trash the teachings of L Ron Hubbard and Scientology in the national press, while any comparable polemic against Islam will get you vilified if not arrested? Of course, we all know the reason: Scientologists tend not to meet criticism of their founder or disrespect of their dogma with riots, guns, suicide vests or machetes. But the ‘evil cult’ smear still raises questions of what constitutes a valid faith or a legitimate religion. Is Islam worthy of respect because it has a long tradition of philosophical and theological reasoning to underpin its doctrines? Is Scientology not worthy of respect because it has no such tradition? Are we therefore saying that being wrong for a very long time justifies more respect than being wrong for just a short time? Morgan refers to the Church of Scientology as a “deeply unpleasant organization”. He says its leader David Miscavige is a “manipulative monster”. He refers to Tom Cruise’s staring “in a wide-eyed, excitable, slightly demonic way, cackling insanely”. And he pinpoints the CoS strategy for dealing with criticism: “Denigrating opponents is their default position to any perceived attack.” His conclusion is that Tom Cruise is “a nasty piece of work conspiring with an even nastier cult to treat people like dirt and manipulate their minds”. As far as we know, L Ron Hubbard didn’t advocate beheading non-believers or the massacring of Christians and Jews. He didn’t buy, sell or own slaves. He didn’t assassinate his religious enemies or political opponents. He didn’t seduce believers to blow themselves to smithereens with promises of eternal carnal pleasure. He didn’t seek to spread his faith by the sword with a strategy of ‘convert, subjugate or kill’. Indeed, the CoS professes to be a church of social action, involved in the rehabilitation of criminals, drug addiction, drug prevention and human rights. They seek a civilisation without war, without criminality and without insanity, where honest people have rights. Any notion of cultic brainwashing tendencies is naturally offensive to them. The Church of Scientology is opposed to democracy, and presupposes a very black and white image of the world, comprising those who are friends and those who are foes. This has led to the perception that “Scientology uses totalitarian ways of handling problems and even people”. In Germany in particular the CoS has been under surveillance for years, with accusations that it is “involved in activities directed against the free democratic order” and the country’s constitution. They further assert that “Scientology is a totalitarian commercial cult. It is dangerous because Scientologists are against freedom of religion and freedom of opinion”. All of which criticism might reasonably be directed at Islam. And yet Islamophobia is objectionable, while Dianephobia is commendable.